Roger Moore in The King's Thief. Roger Moore signed a seven-year contract with MGM in 1954 at the age of 27. Although he had studied at the Royal Academy of Dramatic Arts, Moore didn't consider himself a very good actor. But the truth is that he had already developed the on-screen charisma that would define his stardom--well, that along with his good looks. Roger Moore is not the star of The King's Thief, a modestly-budgeted 1955 costumer about a plot to overthrow King Charles II. Edmund Purdom has the role lead of Michael Dermott, a former soldier loyal to the king who has resorted to robbing wealthy noblemen. 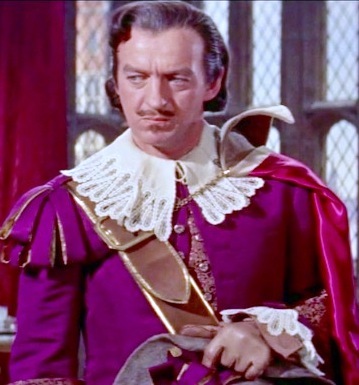 One such target is the Duke of Brampton (David Niven), who seems particularly distraught when Michael steals a little black book in addition to some jewels. The book contains the names of influential landowners who support Charles II. Brampton's plan is to dispose of them one by one, claim their estates, and eventually oust the king. 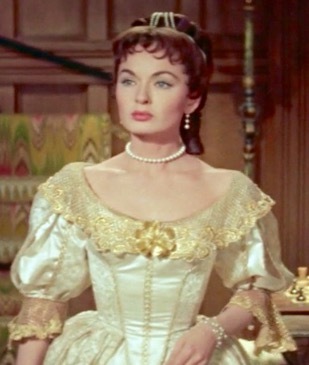 Ann Blyth as Lady Mary. Meanwhile, Michael meets beautiful Lady Mary, whose father was one of Brampton's first victims. She seeks revenge and recognizes that Michael could be a valuable ally. So where does Roger Moore fit in all this? He plays Michael's right-hand man. The King's Thief is something of an oddity. Running a scant 78 minutes, it was clearly not intended to be a lavish historical drama on the scale of MGM's Ivanhoe (1952) or Knights of the Round Table (1953). Some of the backdrops give the film a cheap look, although there's a fairly impressive recreation of a medieval town. The film also boasts rich color and was filmed in Cinemascope at a time when that was a luxury. David Niven as the villain. Edmund Purdom, who supposedly took over when Stewart Granger dropped out, makes an adequate hero--but there's nothing exciting about his performance. His career in Hollywood was short-lived and it's not hard to see why. However, the rest of the cast is first-class, with David Niven as the suave villain, Ann Blyth as the plucky Lady Mary, George Sanders as Charles II, and, of course, Roger Moore as Purdom's pal. Purdom and Moore share the film's best scene, a prison escape in which they climb up through a chimney, cross over into a bell tower filled with whistling winds, and then descend from the tower and rooftops. 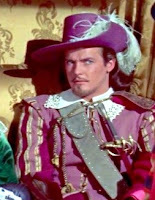 Roger Moore followed The King's Thief with Diane (1956), another costume drama in which he was third-billed after Lana Turner and Pedro Armendáriz. Still, big screen stardom eluded him and he found work as a regular in 1950s television shows such as Ivanhoe, The Alaskans, and Maverick. In 1962, he was cast as Simon Templar in The Saint TV series...and the rest, as they say, is history. Poor Roger - prettier than his leading ladies then. If he'd been around in the '30's/'40's, he might've had David Niven's career. As I was reading along about the plot of The King's Thieve all of a sudden it hit me - the tower scene! A truly exciting bit. And I love Sanders as the king. Actually, I loved watching Roger at this stage of his career as well. Focusing on it is a lovely and fun tribute. 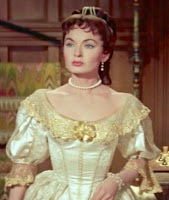 The costumes are lovely, enhanced by the color and CinemaScope. The escape scene is quite good. 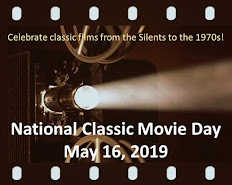 This is an enjoyable little film and I thank you for your post, Rick!